Knitting for charity for children is an act of compassion. More importantly, it makes a difference. When you crochet or knit a square, a hat, or hand-warmers or make a cuddly toy, you’re doing more than warming a child. They are a currency of hope to tell them how beloved they are. We tell these orphaned or vulnerable children as we wrap them in your warmth, they are unique and special. They are the future. These children have a future. They are the future. The ever escalating population of children orphaned as a result of HIV/AIDS and poverty in Africa is one of the least addressed, and most challenging tragedies facing the world today. Nelson Mandela, the much loved South African humanitarian, once equated the world to a human body. He said that in the same way that a human body cannot deny the impact of gangrene in a limb, the world cannot ignore the consequences of this scourge in Africa. To do so is not just immoral, it imperils us all. Knit-a-square is a much loved, world-wide community of compassionate crafters who address this massive humanitarian crisis, one square at a time. One hat or cuddly toy at a time. One beautiful, hand-made blanket at a time. Every time a compassionate crafter makes a loop to cast on, or start to crochet, or loom, they are thinking about these children. They are directing their focus toward this issue. When they pack and post their squares and hats, they send them with love and hope for the children’s future. When the parcels arrive in South Africa, they are opened, sorted and bundled with gratitude and joy. 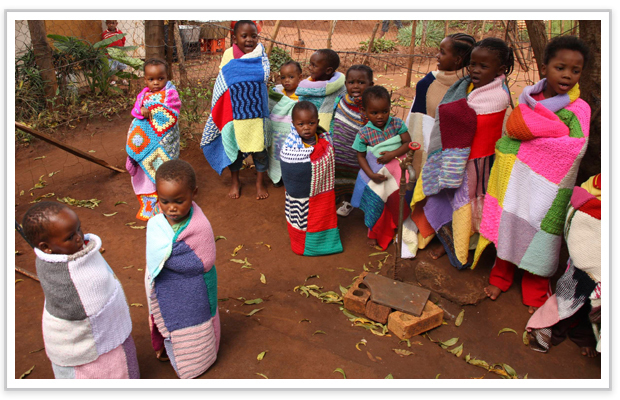 When the grandmothers sew the squares together to make beautiful blankets, their role in caring for the children is acknowledged. When the volunteers search the informal settlements for small crèches (daycare centres) where these small children are cared for during the day, they carry with them the knowledge that a worldwide community cares. 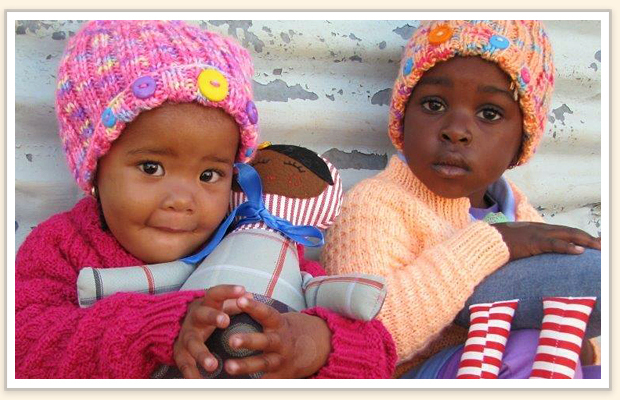 When they wrap the children in the warmth of your work – your blankets, hats and hand-warmers – and place a handmade toy in their arms, they do it on behalf of you, and with your love. The children are told they’re unique and special, and they have a future. The carers, often struggling to look after the children with almost no support, see this and know they are not alone. Crocheting and knitting for charity for children cannot on its own remove the problem. But, we can make a positive impact on the lives of the children, the grandmothers (gogos), the volunteers on the ground, and the carers in the crèches. Most of all, in our own lives, we should know that our crocheting and knitting for charity for children rewards us, as we know we are doing something, just one square at a time. Tell everyone you know about what you’re doing and why. For every person you tell, who didn’t know before, you’re raising awareness and creating a small ripple. If they can’t crochet or knit a square, then ask them to gift a small monthly donation. Every dollar, just as every square makes a difference.